You know we love to share fabric sightings...the more creative, the better! 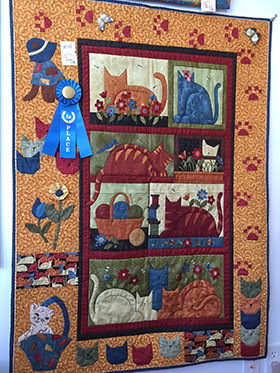 Bolt, a quilt shop in Maine, recently held a challenge using Cheryl Haynes' Crafty Cats collection. Here's a peek at a couple of the entries; head over to Bolt's website to see the rest! Today we're showing Ann Lauer's Irresistible Iris collection in two very different looks. These are both projects Ann designed for magazines; you'll find links to the magazines and to kits for the projects below. First is "Perennial Favorite," the name a nod to these old-time favorite flowers that many people fondly remember from grandmother's yard. 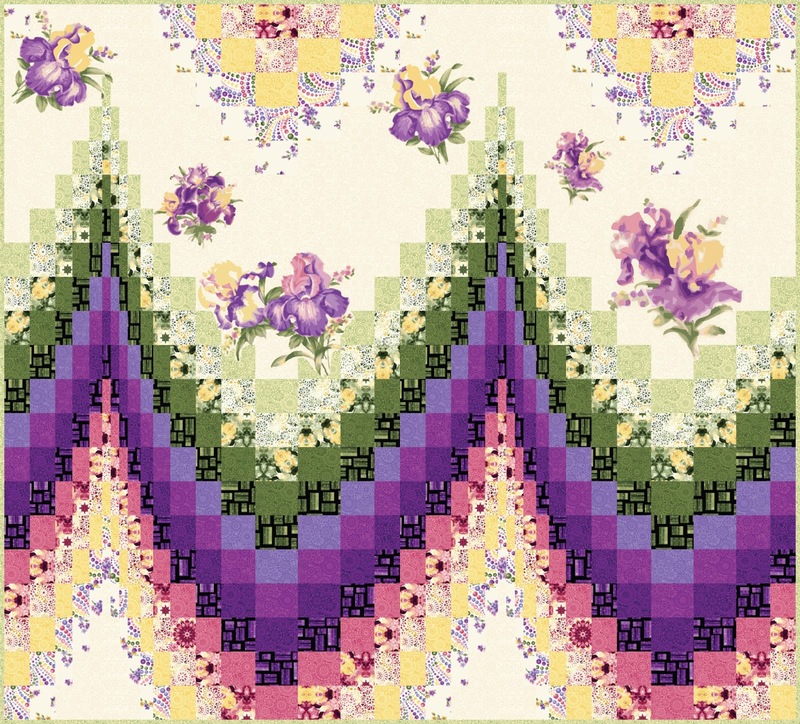 This classic bargello has plenty of movement and is accented with fussy cut iris blooms. Why do you enjoy designing bargello style quilts so much? I wanted to experiment with using the wonderful medallion tonals and the color play in values. I also chopped up several of the big prints that have a lot of movement. Everything came together, and I was really happy with the result. 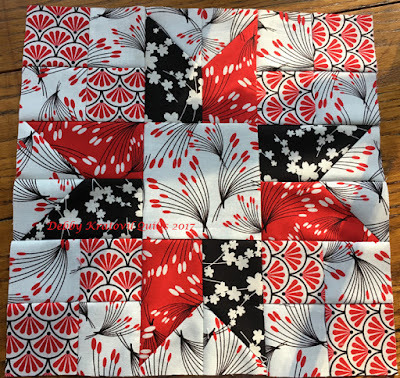 How do you design a quilt like this? I play around on the computer. 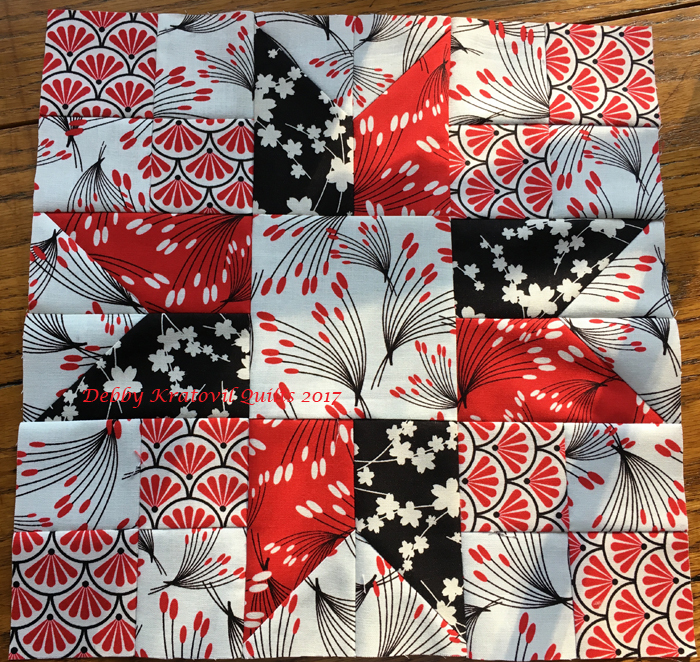 I’ve designed many bargellos, so I look at previous quilts and pick an area of peaks and valleys to start with, and work from there. I generally choose an asymmetrical design, with peaks of different sizes. This allows the bargello to be the focus of the design. In Perennial Favorite, the peaks are the same height, but they create plenty of cream background space to highlight the fussy cut irises. 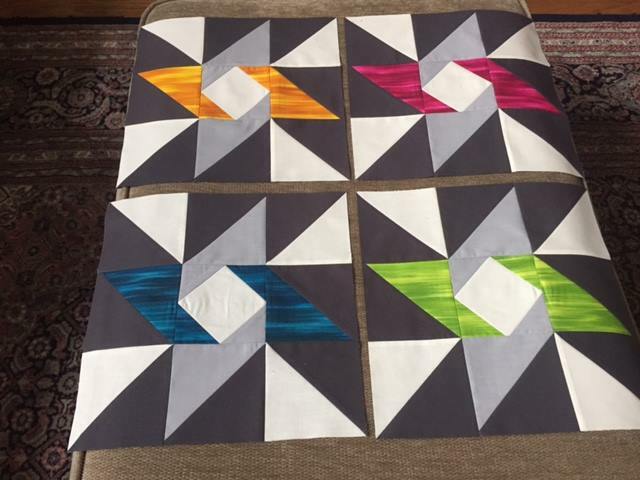 What makes this collection work so well with the bargello concept? The irises are the key print in the collection, but I’ve used the blenders in the pieced background. The prints have a fluid, watercolor feel to them. I love how the lacey medallion print has so much depth because it includes multiple colors (as opposed to the tonals). 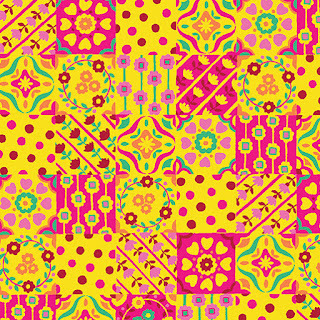 The medallions dance across the fabric, and they’re a great blender between the more solid colored prints. 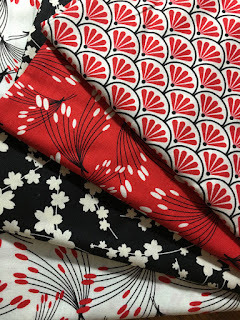 The kaleidoscope print is great as well—so much movement and such a good transition fabric. The Vari Recs print as well—because they are filled with variegated color rectangles, they create a great transition. 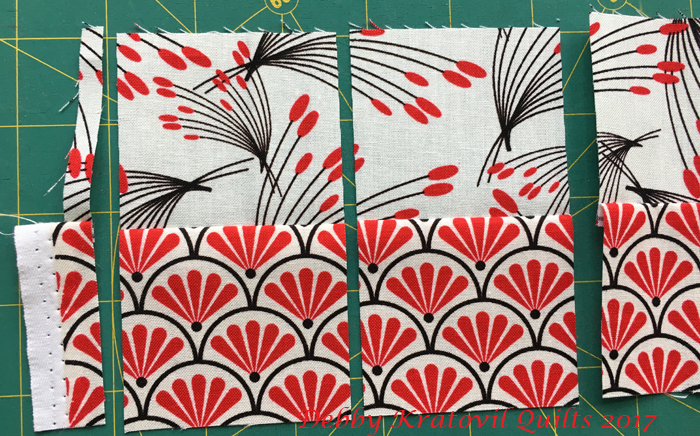 These prints work well for color changes in the bargello, shifting from “solid-look” print to “solid-look” print. Tell us about the fussy-cut irises. There are two sizes of irises fussy cut out of two different fabric. They’re fused and then fastened with raw edge applique. The background of the iris prints is the same as the background of the bargello, so they blend nicely. Benartex’s printing of these irises in particular is just spectacular. The details are exquisite and it printed gorgeously. They become the focal point of the quilt. What else can you tell us about this quilt? I recommend making it in a quilt as you go style. The quilt comes out totally flat, and you’re not dealing with stretching or an accordion appearance. I also use the gridded flannel as a base. It helps keep all of the pieces straight, and it stabilizes them as well. The lines from quilt as you go enhance the movement of the bargello without having to stitch over the top of it, which could be distracting. Click here to purchase the Perennial Favorite kit. Here are the Irresistible Iris prints in a totally different look. 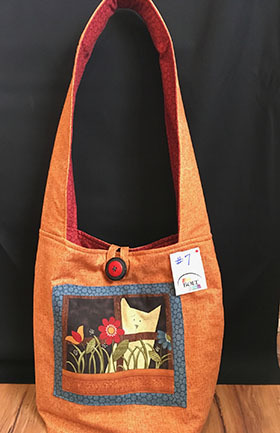 Ann built the design around the kaleidoscope print, combining it with blenders. 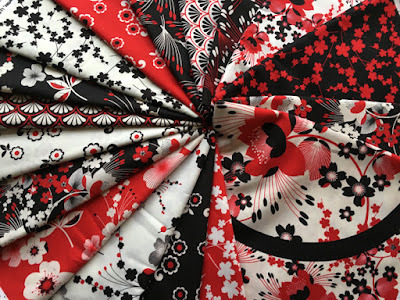 The only flowers evident are the tiny flowerettes in the black background fabric. What prompted you to design a quilt without any iris prints? I really wanted to showcase the kaleidoscope print, so that’s what I did. It’s the focal square in the middle of each block, and then the tonals work together, and the flowerette print segues into the purple and pink. I like the how the lighter green stars come toward you and the darker green fades back. What do you like best about the runner? Besides a chance to showcase the kaleidoscope print, I like the green and purple prints together. Then the black adds depth and the pink is an accent. Using the black print in the binding pulls it all together as well. Is this a difficult block? 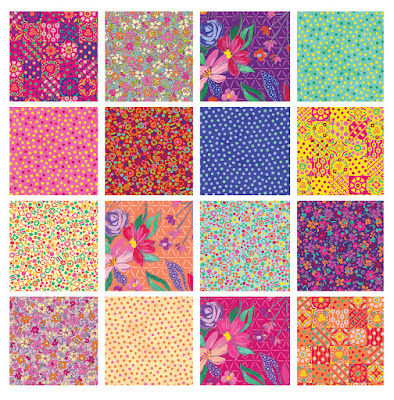 Click here to see Ann's entire Irresistible Iris collection. Click here to visit Ann's website. 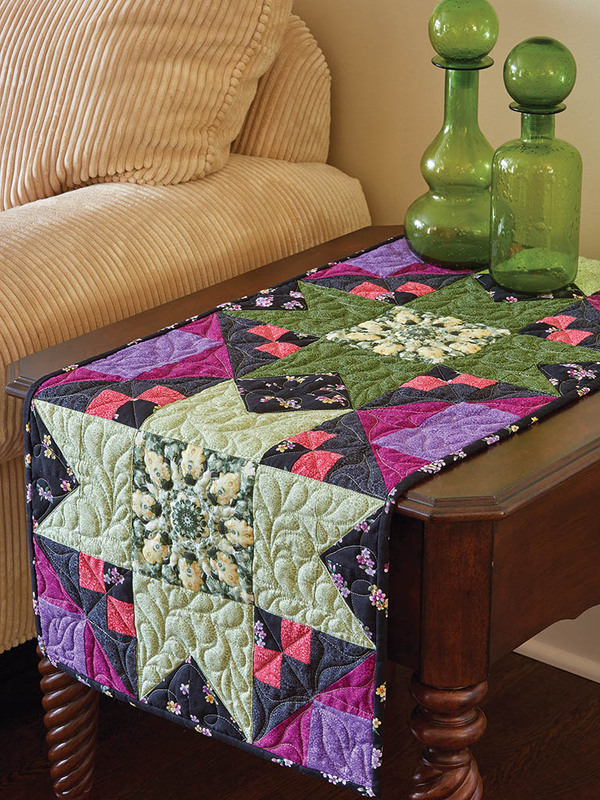 Click here to purchase the Floral Fantasy table runner kit. 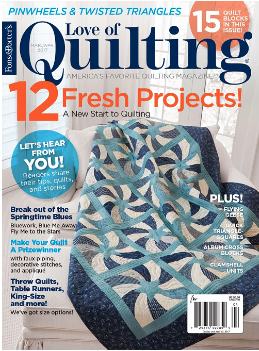 Click here to find Fons & Porter's Love of Quilting magazine. Hi! 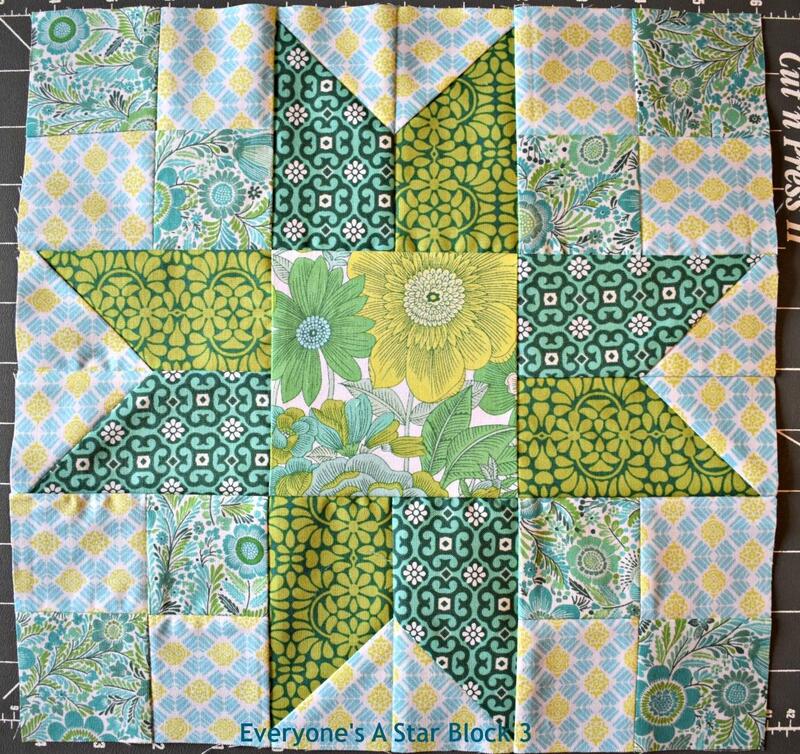 Debby here with Week #3 Block in the "Everyone's a Star Quilt Along." I chose the beautiful Moon Flower collection. I'll just quote the description from the Benartex website because it says what I'd say anyway! 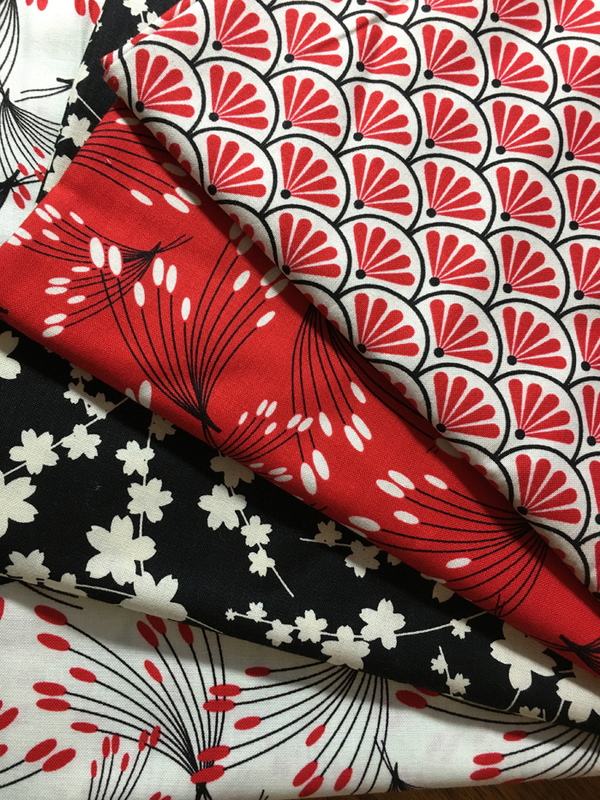 "Red, black, and cream make a bold statement in this beautiful Asian inspired collection! 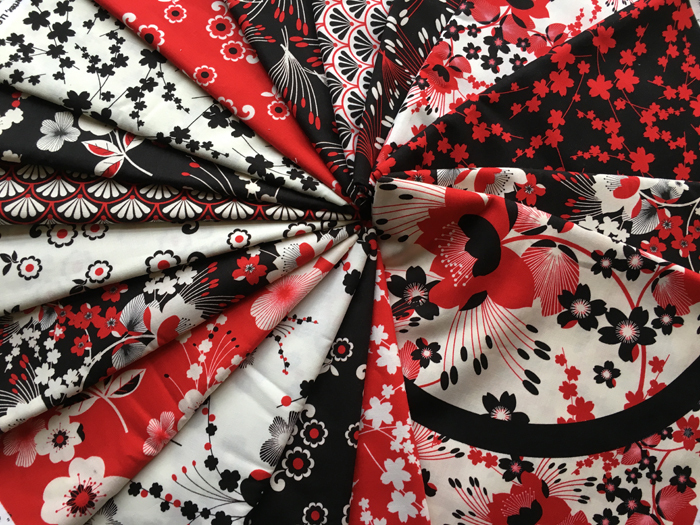 From the large circle prints to the flowing “Oshi Stems”, Moon Flower is a design masterpiece, destined to make quilts to be treasured for years to come." Let's see the fabrics again, OK? It was so difficult to choose just 4 fabrics for my block, but somehow I did! Now let's see some steps. First, instead of cutting all those D squares (2-1/2"), I cut one 2-1/2" strip of each fabric, stitched them together, and then cut 8 two-square units as shown below. 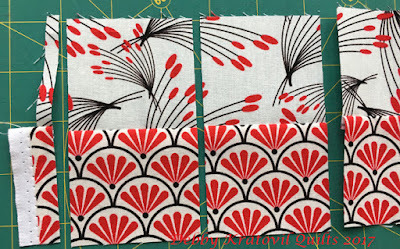 Then, these are sewn into four 4-Patch units. I eliminated the funky shaped template of that B shape in the diagram by using an easy method. 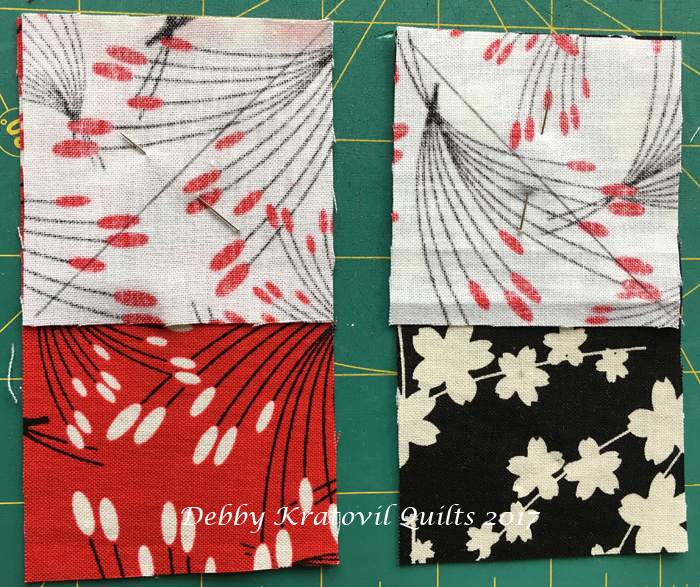 I cut four red and four black rectangles 2-1/2" x 4-1/2". I also cut 8 light squares 2-1/2" x 2-1/2". I drew a diagonal line on each as shown. I will SEW on this line, but note how I have them aligned. Stitch along the drawn line; trim 1/4" away from stitched line (discard the waste triangles). Press triangles as shown. 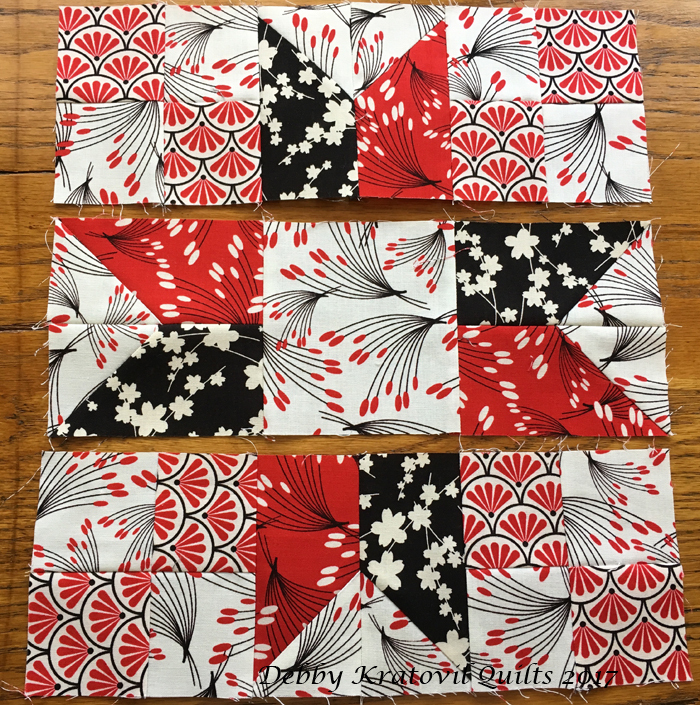 Make four sets of these for each block (I made 4 blocks for this quilt). 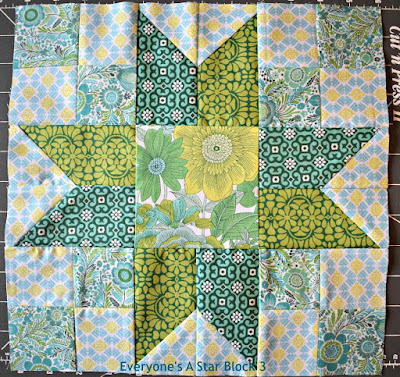 Here's Stephanie's Star Block #3, made using Liberty Garden. Head over to her blog to learn more about it. Here's Lisa's Star Block #3, made from Zentastic. 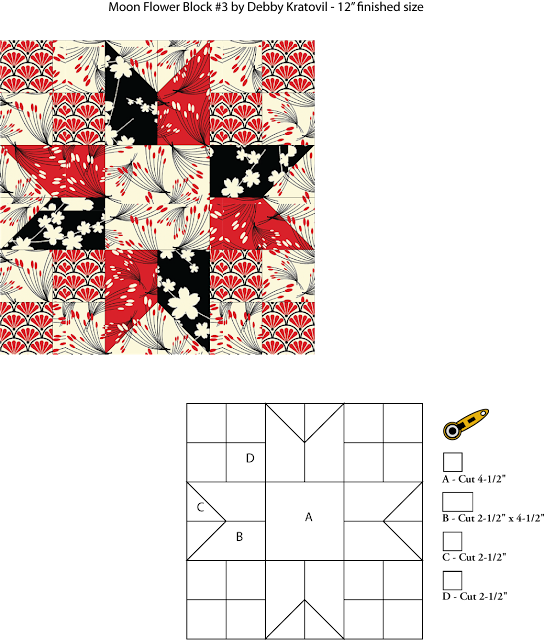 Come back Thursday, March 2nd to see how to assemble the quilt! Join us to make this quilt in just 5 weeks! Which version will you make? 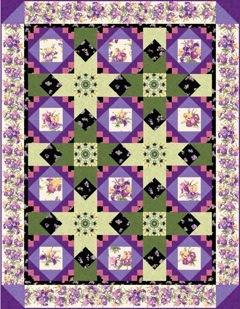 Or will you use another Benartex, Kanvas, or Contempo line to create our Everyone's a Star quilt? Share your progress by e-mailing your pictures to us at BenartexQAL2017@gmail.com – we will post them on Facebook and Instagram throughout the Quilt Along. 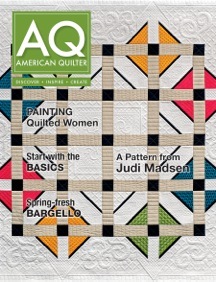 We are looking forward to quilting with you! Email your photo by Thursday, April 6, 2017 to be entered in the drawing. 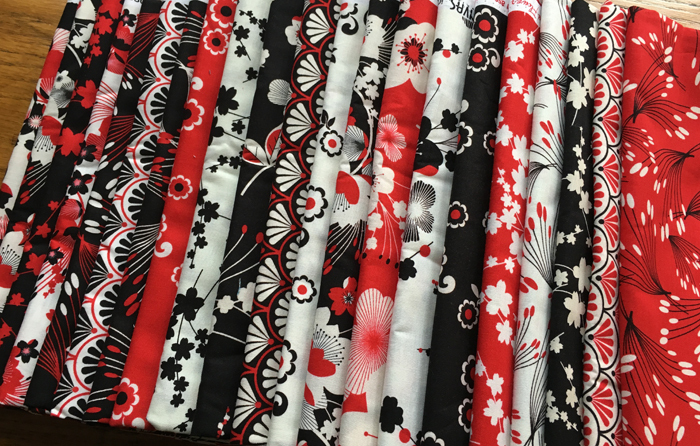 We're all ready for the flowers and fresh colors of warmer weather, and the Summer Garden fabric collection will help us get there! 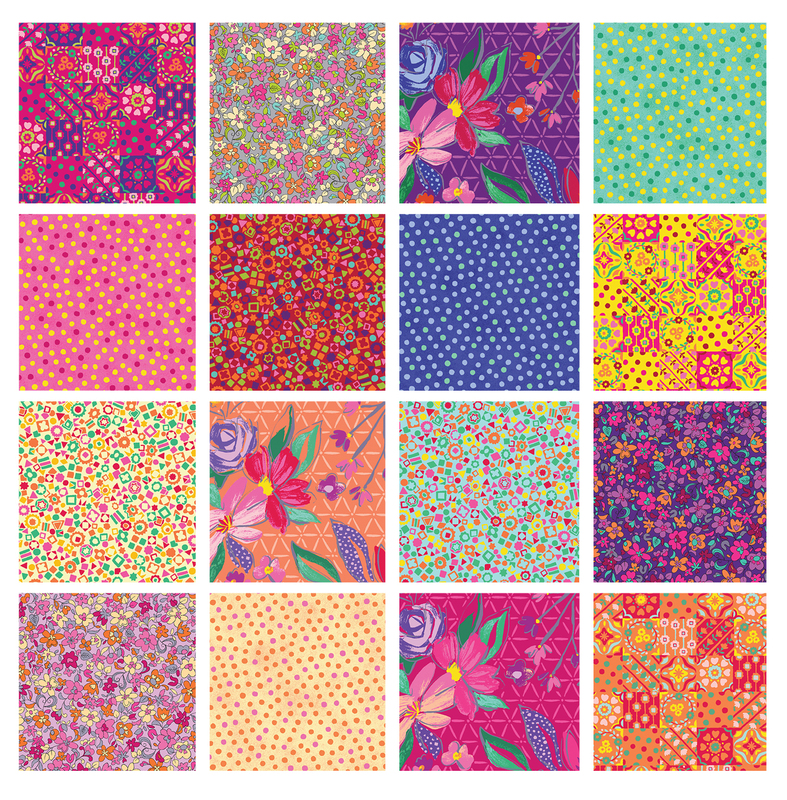 These fabrics are pure fun--large and small florals, geometric prints, dots, and a fun patchwork square print. Bright pinks, purples, yellows and oranges will make a cheery quilt! Love the paint strokes in these flowers! 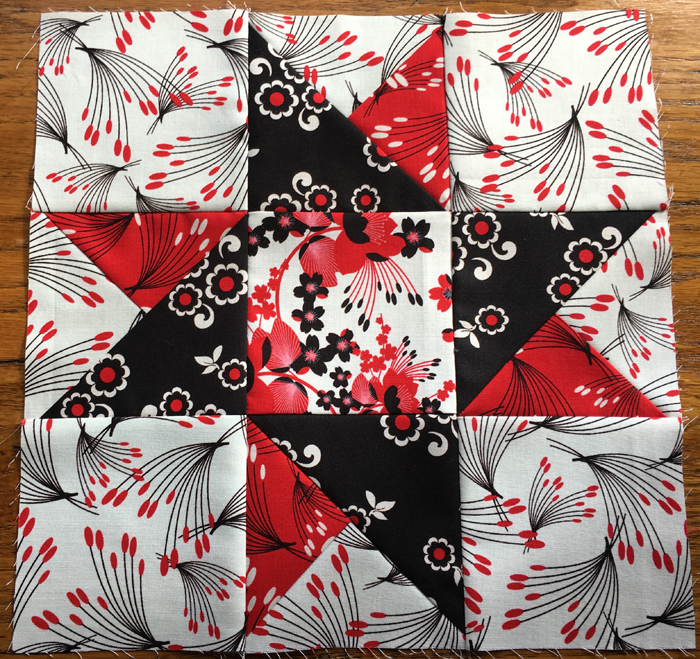 This patchwork print would be wonderful for a backing or a border! 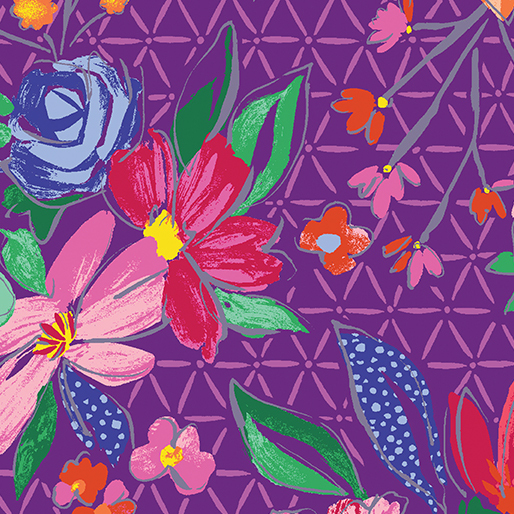 Click here to see the entire Summer Garden collection. What do you know about Presidents' Day? What are we actually commemorating on the third Monday in February? According to History.com: "Originally established in 1885 in recognition of President George Washington, it is still officially called “Washington’s Birthday” by the federal government. 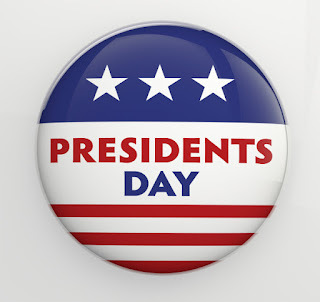 Traditionally celebrated on February 22—Washington’s actual day of birth—the holiday became popularly known as Presidents’ Day after it was moved as part of 1971’s Uniform Monday Holiday Act, an attempt to create more three-day weekends for the nation’s workers." Four presidents actually have February birthdays: Washington, Lincoln, William Henry Harrison and Ronald Reagan. While Washington’s Birthday was an unofficial observance for most of the 1800s, it was not until the late 1870s that it became a federal holiday. The holiday initially only applied to the District of Columbia, but in 1885 it was expanded to the whole country. Washington and Lincoln still remain the two most recognized leaders, but Presidents’ Day is now popularly seen as a day to recognize the lives and achievements of all of America’s chief executives. Click here to learn more about Presidents' Day. Click here to see one version of the nation's presidents commemorated in quilting. Are you familiar with the Washington's Puzzle quilt block? Click here to see directions for making it. p.s. Don't forget...the post office and banks are closed for Presidents' Day! 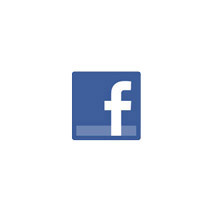 Hi everyone – Stephanie here! I really love star blocks – they are so versatile and fun to make! And the Liberty Garden fabric line … how can you go wrong with shades of blue and green? 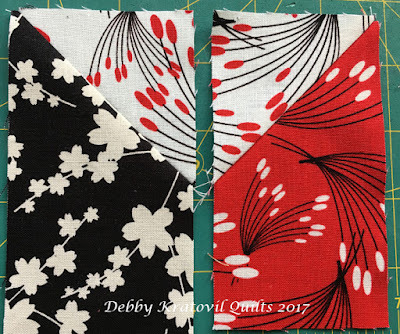 When I first looked at the pattern and the fabrics, I decided to go totally traditional – it appeased my “matchy matchy” sensibilities. 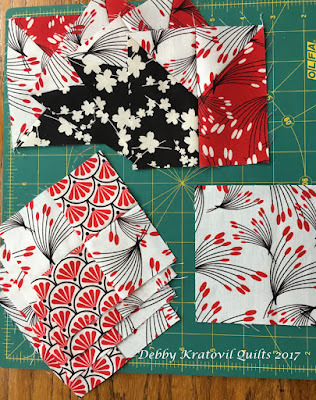 I am making all of the blocks using the same 4 fabrics, and all 4 of each block exactly the same. I hope you enjoy my “traditional” interpretation of “Everyone’s A Star”. Ok – you ready? Step one … because we are going to be cutting and sewing on the bias, I like to lightly starch and press my squares (the Light, Medium and Dark listed above). This helps to reduce stretch along the bias side when sewing. Got that done? Great … time to cut and sew! Take your 5-1/4” squares (light and medium) and cut them twice on the diagonal – giving you 4 quarter square triangles (QST). 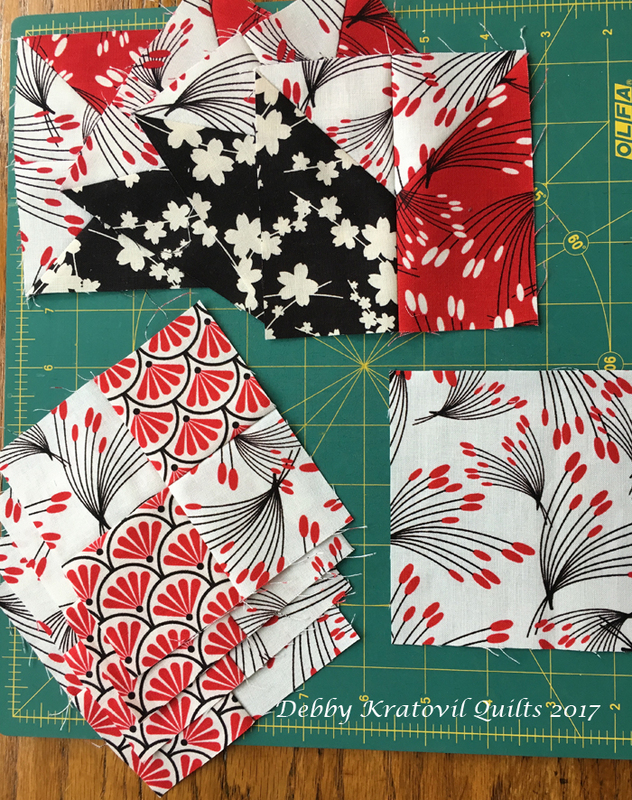 Take your 5” squares (dark) and cut them once on the diagonal – giving you 2 half square triangles (HST). Sew (1) light QST and (1) medium QST together and press. Next up – sew (1) dark HST to light/medium QSTs (the way I do this is to gently fold the dark HST in half, find the middle and place a pin there. Open up HST and line up seam from light/medium piece. Pin together and sew). Make (4) for each block – so (16) total! 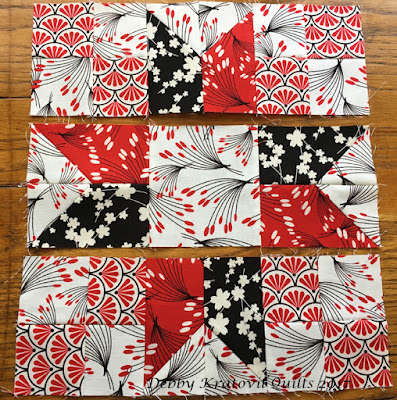 Bonus block – if you sew 4 of them together as shown – you get a great 8” finish pinwheel block … but don’t do that with these, you need them for the next step! 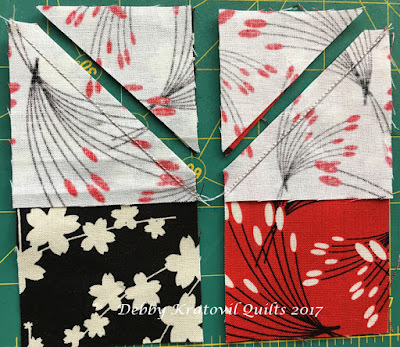 Layout your focal square, your small floral squares and your pieced squares as shown, sew into rows, then sew rows together to complete Block 2! Square them up to 12-1/2” and make 4. 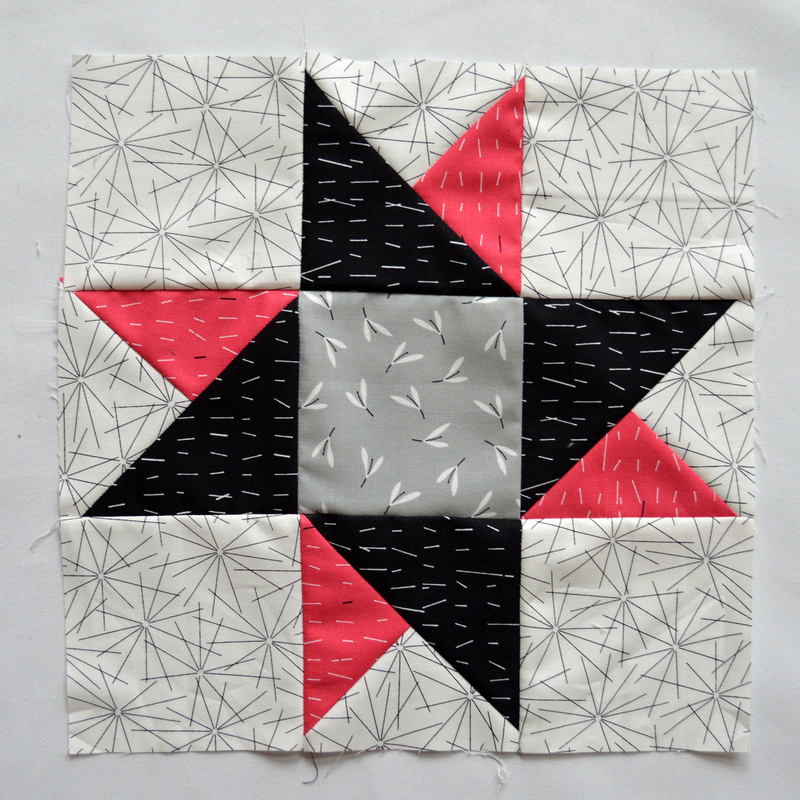 Here's Debby's Star Block #2, made using Moon Flower. Here's Lisa's Star Block #2, made from Zentastic. 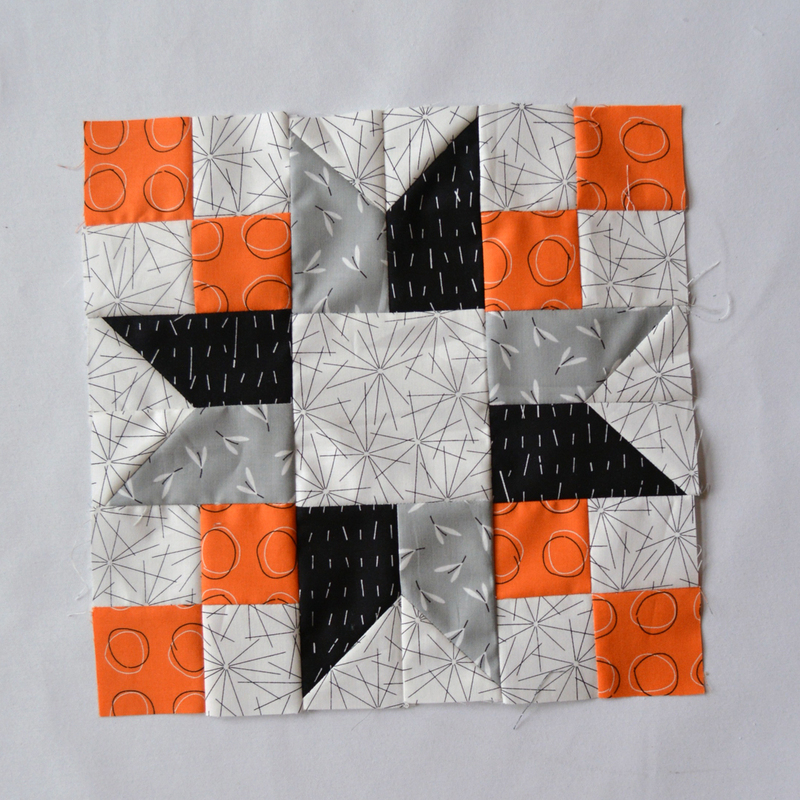 Come back Thursday, February 23rd for the tutorial to create Block #3! Join our Joey scavenger hunt!